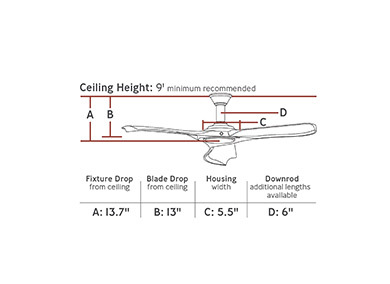 Building on the enthusiasm for the Minimalist ceiling fan, a 72” version is offered as the Minimalist Max, featuring a powerful DC motor, integrated LED light kit and damp-rated status. With the same clean, modern aesthetic and three dramatic Hand Carved Balsa Wood Blades, the Minimalist Max fan by Monte Carlo features an integrated 16W LED downlight encased in Opal Etched Glass, with 1100 net lumens of output, 2700K CCT and a CRI of 80+. A hand-held remote with six speeds, reverse and LED light dimmer is included. 15 degree blade pitch designed for optimal air.